These pre-programmed analog function module and sensor combinations are ready for plug-and-play installation on the V-Net cable. Racepak�s Vehicle Network (V-Net) is a �smart data� transfer network providing the ability to transmit multiple signals from each sensor over a single cable. This technology creates a system in which the individual components interact with each other; making a simpler, more compact system which can be expanded with ease. The key to accomplishing this is in the modular connectors that attach each of the devices to the main V-Net cable. Each module is essentially a miniature computer, which houses circuit boards and a microprocessor that identifies and retrieves only the proper incoming signals and allows other signals to pass through. 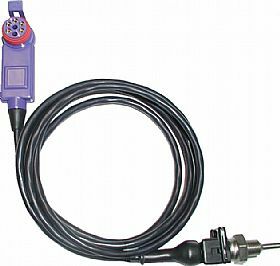 Whether you will be installing a single gauge set up, or a full-blown data acquisition system, all components are attached to the system using the modular snap-together connectors. Adding components onto the system is simple. Just find a junction in the main V-Net cable, separate the connectors, and sandwich the new sensor�s module between them. Then command your software to read the new configuration. It will automatically recognize any additions or deletions from the system. Gauge integration is another strength of the V-Net system, but don�t mistake the Racepak gauges for garden variety gauges. If your vehicle is equipped with a V-Net recording system, the gauges simply use the sensors and wiring that are already in place to provide full time display of the data being monitored. The same holds true for Racepak�s digital display dashes. Some models of the dash will rely solely upon the data recorder�s sensors to provide the information they display, while others are stand-alone requiring no data recorder. When you add Datalink II, the best Windows�-based software in the business, you will see why Racepak continues to be the most popular and widely used data acquisition system in the industry. In order for a function to be monitored on the V-Net, the signal from that function must pass through two components: a sensor and a module. The sensor is the unit that actually measures the input from the function (i.e. pressure, temperature, etc. ), while the module converts the signal so it can be transmitted over the V-Net.